A parachutist’s fall to Earth is determined by two opposing forces. A gravitational force of 539 N acts on the parachutist. After 2 s, she opens her parachute and experiences an air resistance of 615 N. At what speed is the parachutist falling after 10 s? This is College Physics Answers with Shaun Dychko. During the first two seconds of this parachuter's fall, they have no parachute and so they're falling with an acceleration due to just gravity. So the net force is the force of gravity on them because there is no parachute providing a drag force upwards. There will be some drag force on their body but I think we can presume that's negligible since their body is pretty small. So this is going to be mass times acceleration then since it is the net force. I've written acceleration with a subscript one to say that this is the acceleration during this first interval of time from zero to two seconds. So we have to break this problem into two steps, once during the first two seconds and then the second step from two seconds to ten seconds after they have deployed the parachute. 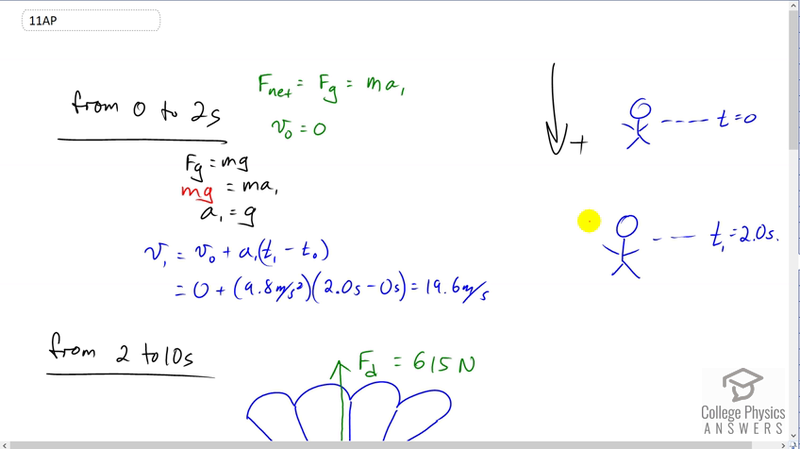 So let's figure out their final speed after the two seconds is finished and we know that since fg is mg, force of gravity is mass times gravitational field strength, we can say this is >i>mg equals ma and the m's cancel, meaning that the acceleration due to gravity is going to be the acceleration. So that's kind of a long way of saying something we kind of already knew. The speed v one at the end of this first time interval is going to be the initial speed which is zero, plus the acceleration which is found, times the time interval which is t one, which is two seconds, minus t naught which is zero. So that's 9.8 times two which is 19.6 meters per second. Then at two seconds, the parachute is deployed and there is a drag force of 615 Newtons upwards and our job is to figure out what will the speed be at the end of the second time interval, at t two. So that v two will be the time at the beginning of this time interval which is v one that we calculated in the first part of this question. That's going to be the acceleration two, the acceleration that occurs during this interval of time, multiplied by t two minus t one minus the eight seconds of this time interval. So, acceleration two is something we have to do some work to figure out. We know that -- well, let's write the net force equation down first. We know that -- we're taking downward to be positive by the way, I'm not sure if I mentioned that, but this question is asking for the speed of the person and so they're not asking for the velocity -- it's just kind of easier to write down to be positive, it's a personal preference thing. You can write up to be positive if you like, but I've written down positive which means the drag force is negative upwards and gravity is positive downwards. So that's why I have a minus sign in front of the drag force, so negative drag force plus the force of gravity equals mass times acceleration two. We'll divide both sides by m and we get acceleration two is negative fd plus fg over m. Now we need to figure out what this m is though, and so we turn our attention back to the first part of the question where we knew that the force of gravity was the net force, and so it was mass times acceleration one and we can solve for m by dividing both sides by a one but a one was just 9.8. So we take the force of gravity which would have been the same in the first part of this question as it is in the second part, 539 Newtons, and divide that by 9.8 to get 55 kilograms. So that is what we can plug in down here. So we have negative 615 Newtons, that's the force upwards, plus 539 Newtons the force down, divided by 55 kilograms to get negative 1.3818 meters per seconds squared. So that's an acceleration upwards in this question. So v two then is 19.6 meters per second that we calculated for the first part, that's v one here, and then plus negative 1.3818 meters per second squared acceleration, times 10 seconds at the end of this time interval, minus two seconds at the beginning of this time interval. This gives 8.5 meters per second as the final speed of this parachuter after the full ten seconds from the initial jump.